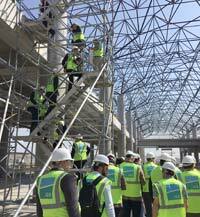 As part of the efforts to increase the contribution of local industrial enterprises to megaprojects in Turkey, the Istanbul Chamber of Industry (ICI) paid a visit to the Third Airport construction site with member industrialists. Fifty-nine industrialists attended the meeting held at Odakule on January 7, 2016. 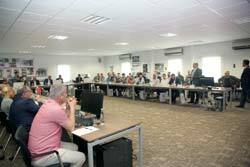 The event was the continuation of the meeting held with IGA –contractor of the Third Airport’s construction. Located in Arnavutköy the Third Airport of Istanbul still holds the title of the world’s biggest airport. The ICI Member industrialists who visited the construction site viewed a detailed presentation by the CEO Consultant Irfan Gündüz on the production ecosystem. In addition, Yusuf Akçayoğlu, IGA CEO, gave updates to the press members who accompanied the group. Gündüz made statements about the phases and progress of the project. The attending industrialists then proceeded to the construction site where they received further information. Irfan Gündüz and Mustafa Ceylan, Procurement and Logistics Director, answered questions from attendees who enjoyed the opportunity to get a closer view of the Third Airport of Istanbul, the world’s biggest airport construction project. 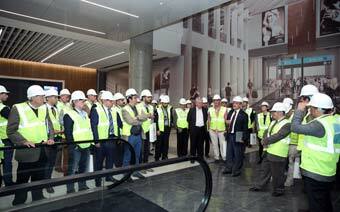 CEO Yusuf Akçayoğlu stressed their complete reliance on local brands for the interior design. According to Akçayoğlu, stone samples were collected from all corners of Turkey, and the company was willing to push its limits to procure all supplies –despite their rarity– from local brands. After presentations and briefings, the industrialists examined an exact model of a finished passenger terminal alongside press members. They also observed the vast construction site at an elevated point and had their photograph taken with IGA executives.